There has been a lot of change around what we now call the Glen Iris Inn. When Mr. Letchworth was alive, the Glen Iris Homestead had a large garden, barn and several addition outbuildings nearby. The building shown above would be one of the structures that once stood in the vicinity of the present Park Museum. Such photographs are rare. With the Portage Gorge, beautiful falls, and the historic Council Grounds nearby, visitors seldom photographed storage barns and other mundane topics when they visited the Glen Iris grounds. "This is one of the small group of buildings that stood to the west of the huge Kitchen garden hedge. The carriage house is to the right. 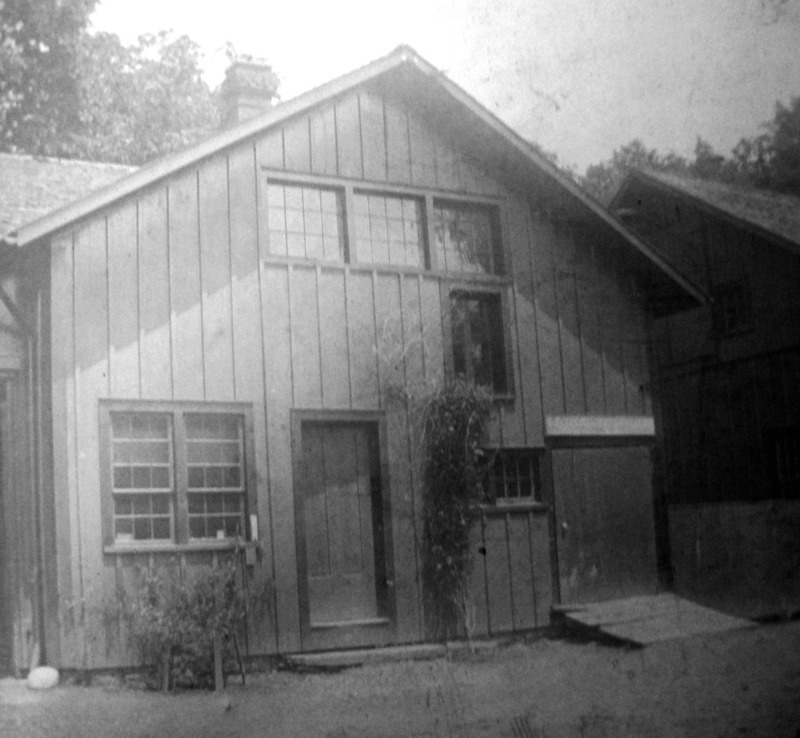 The carriage house/barn was relocated here from a position farther east as part of the 1878 (I think 1878) reworkings at Glen Iris for Mr. Letchworth. There are partial images of this building in the Glen Iris collection, the ones with the cats and kittens etc. I forget which one the name of this is. This one is cool too and probably was not one of the ones moved here because of the reused parts in it. Note the two panel door, an original GI door of which many were removed as part of the alterations Mr Letchworth made in Glen Iris, mostly though in the 1870s. Also the windows are reused early 19th century windows also possibly from GI or other buildings taken down in the 1870s. Do you know the date of the photo. I would guess 1880s or 1890s. these were some of the first buildings removed by American Scenic and Historic Preservation Society by 1913. These buildings are not well documented, this is good image"
We thank Ted Bartlett for the information and the Nunda Historical Society for allowing us to use the image. For more information on the changes the ASHPS made, read one of their annual reports found here.